Head In Knots: Time of Her Life? 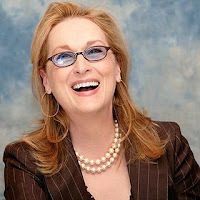 I was never a huge fan of Meryl Streep. I thought she was a good actress, but something about her really bothered me. After the "House of Spirits" movie, I was pretty much done with her. She didn't play the role as I had imagined it from the book (I loved the book), and her low voice didn't seem natural or in tune with the character. But somewhere around the time of "The Devil Wears Prada," she started to win me back. She was able to play that role with the right balance of evil and vulnerability, which I was right on the spot. By "Mamma Mia," she had pretty much won me over. She exuded such a joy in that movie, like there was nothing she could be doing that would be more fun. And now, she has a new movie coming out, where all the previews show her with a permagrin. It's like she realized that she has a pretty awesome job, that she gets awarded accordingly, and that she should enjoy it. It makes it really fun to watch her movies. Again, Mamma Mia was made even better by this inner glow of hers. There is a lightness to that movie, and she really added to it. It made me smile throughout...in the last scene when she's in disco gear, the amount of fun she is having is even most apparent. I wish we could all have that much fun at a job we've been doing for more than 20 years.